When people talk about Western Canada many people have the notion that it has the Pacific coast and Vancouver Island as the only tourist attraction destinations. However, western Canada includes Alberta, British Columbia, Manitoba, and Saskatchewan with these regions also endowed with great attractions for adventure, the Ski resorts, and the Rocky Mountains. If you love outdoors and want a relaxing beautiful destination that will offer an avenue for a variety of activities, then Western Canada should be at the top of the list. The Trans-Canada highway runs the entire width of Canada from the Pacific to the Atlantic. Running for close to 4,999 miles, the highway offers a great avenue for those who are road trip fanatics and the road also connects to other attractions along the way. The Ice trail is a 13-mile trek located in Yoho National Park, British Columbia. 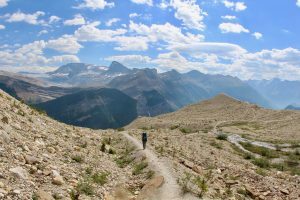 Known as the hiker’s paradise, the trail offers an excellent view of the Rocky Mountains with hikers going past the Daly Glacier overlooking the Yoho Valley. Located in Victoria one of the dynamic cities in Canada, the Butchart Gardens is one of the most visited attractions in the region. The garden features themed floral displays that consist of a Japanese Garden, an Italian Garden, a Rose Garden, and a Mediterranean Garden. This National Historic site has been described as the best botanical and public gardens in the world. Mt. Norquay peak is arguably the highest point across Canada and it’s easily accessible and from the top, you are able to have a good view across the Banff National Park. It’s possible to hike the mountain from Banff town which will take you just a few hours and if you feel that you don’t have the energy to climb the mountain, you can take the chairlift to the summit. On the Rocky Mountains, there are naturally occurring hot springs where visitors have an opportunity to soak and sit on the hot springs. There are a total of nine hot springs in the Banff National Park but Banff Upper Hot Springs is the only developed spring where you will find a place to sit and relax on the hot water as you sample the surroundings of Mt. Rundle. If you are an early riser and you happen to be in western Canada especially during the summer, the view of the mist rising off the still water will help you start your morning on a high note. With a cup of coffee in your hand and seeing your breath in front of you, what a scenery it is.